North-West schoolchildren lacked a local Go event for their Summer term, and thus a new Manchester Summer tournament came into fruition. This was kindly enabled by a generous offer by managers of the use of the top floor (not for the first time) of the Bank of East Asia  in Chinatown. We have a local connection with them, with local club player Peter Yim being a longstanding BEA customer. Big thanks go also to Peter, for facilitating use of the venue. On a hot, Summer's day would you ... (is there a song, there?) appreciate that great use was made of the expansive balcony space, between rounds. This included some much-sought shaded areas, with some sights and sounds of the Great Manchester Run (where Sir Mo Farah won the men's 10K). 22 Go-players squared (or rectangled?) up to each other, with good numbers from Lancaster in particular. The organiser Martin Harvey, with assistance from Bob Bagot, felt obliged to run the event the old-fashioned way, using paper and pen. This was due to a laptop-glitch (well - Martin leaving the printer in the school minibus probably didn't help, either!). Nonetheless, any mistakes thus made were cheerily accepted by competitors, and enjoyment was had, especially by the welcome numbers of younger or weaker entrants. Pick of the bunch was highest-ranked player Alistair Wall  (1d, Wanstead), winning all 3 games (as shown above). This earned him three "cheap Stacey Points ". Not so cheap was Alistair's weekend train travel, as he had fitted in the Welwyn Garden City tourney just the day before. Mind you, it must have been thirsty work for him, as he opted for a prize of three bottles of wine. We were also pleased he came as he, typically, made time to review his opponents' games (and others too) with an understandably large audience. Various extra prizes (wine, cash and sweets) went to five other winners. Two went to the others on three wins - Chun Yin Wong (9k, Lancaster Royal Grammar School) and our French guest Emmanuel Ren (15k, Manchester University) in his inaugural Go tourney. 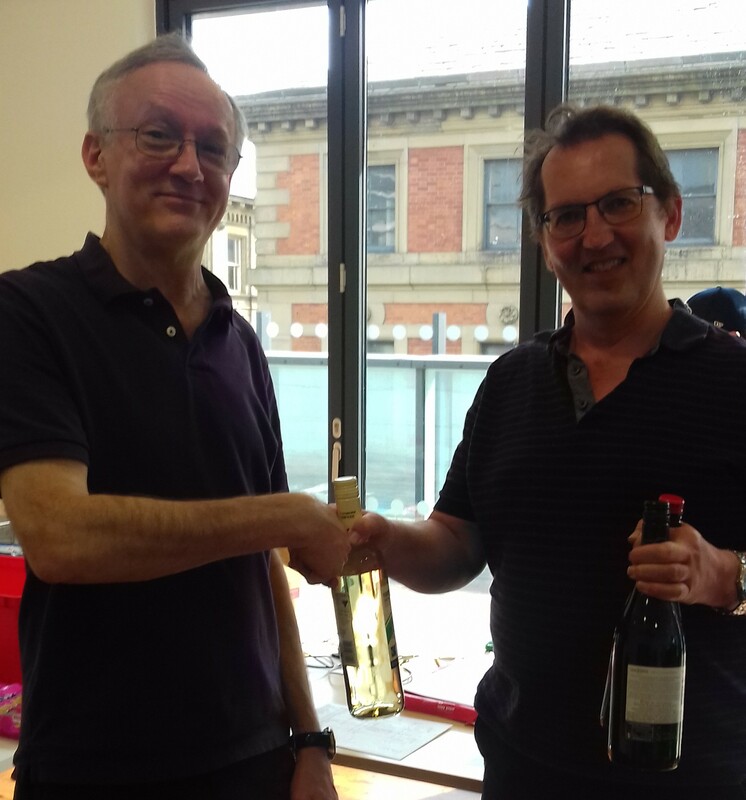 The other three prizes were for Fighting Spirit - to those exemplifying the attitude of carrying on despite not recording wins (of which the organiser has had some experience). 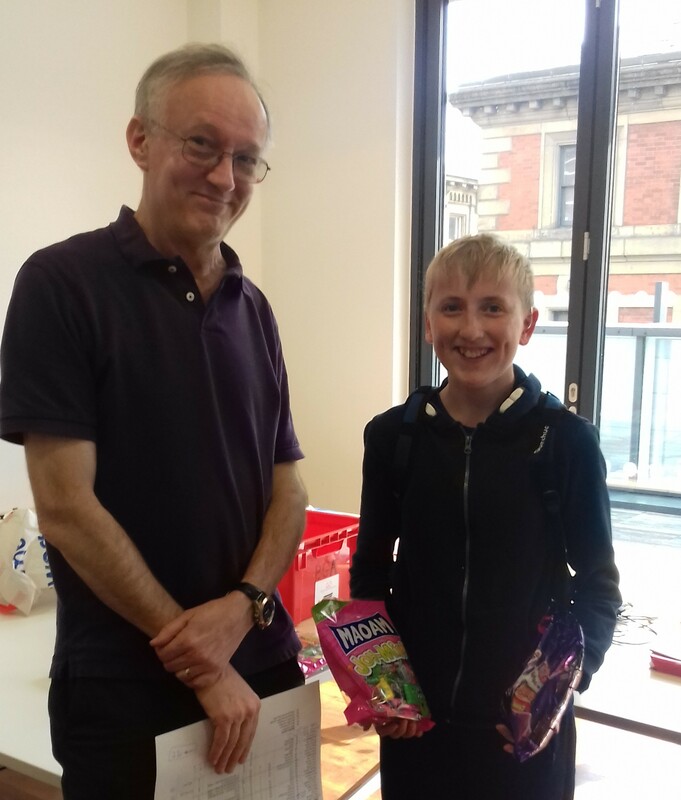 Recipients were Isaac Vincent (31k, Cheadle Hulme School) [his Go-teacher must remain nameless], Adrian Abrahams (9k, Lancaster) and Matt Arnold (16k, Manchester), who nonetheless enjoyed his first-ever tournament. There were even boxes/bags of chocolates and sweets left, going to players who had won two games. Last updated Mon May 28 2018. If you have any comments, please email the webmaster on web-master AT britgo DOT org.